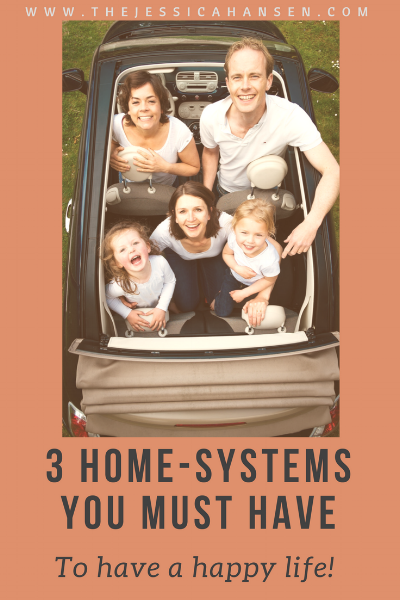 It sounds harsh, but there are three core systems that will bring sanity to your home life when you have a family, and especially when you have a business and a family. I know you’re short on time, and I appreciate the couple of minutes your’e spending here with me today! Let’s dive right in. You can’t avoid this. When you have more than one body to keep track of getting to and from places, (well, you should have one for yourself too, but it’s more important to have one if you have multiples! ), you can’t skip out on this. My personal preference is to have an electronic calendar, and a personal paper-planner. It seems redundant, but the electronic calendar is so much easier to carry with me. I use different Google calendars. They’re free, as many of them as you want. They all overlay into a single calendar view on your phone. Each can be a different color. I have one for me, one for my husband, one for my business, and one for each of my kids. Some are shared and some are not, based on who needs visibility. For example, my personal calendar is shared with my husband, but my business calendar is not - he hates all of the reminders and clutter. This will save you time, energy, yelling, eye-rolling, arguments, sending kids to their room, and pulling your hair out. For real. It ends all arguments when you’re super clear. I have a really awesome system that I designed for my kids. It alternated responsibilities, rotated through the kids, and each room had a written, laminated checklist. The only thing I ever had to ask was - is the list done. If the answer was no, then they weren’t able to do anything else. Now I have my two younger kids learning the ropes of this, since my older two have basically flown the coop. When I was a single mom, working full time, volunteering as scout leader, taking my kids to sports, and trying to hold myself together, these three things were key. I know they’ll work for you too. If you have any questions, leave them below. I’ll answer them in the comments.